Would you like to have me answer your baby or toddler sleep problem in my next video? If so, scroll down and submit your question in the comment section below. I will pick several questions a month to answer and post them here on the blog! My toddler is almost 17 months old. We’ve been co-sleeping and nursing at night since she was born. She was very small at birth and that is what let us down this path. Now that she doesn’t need to nurse at night, I think I’m ready to sleep train her. She’s never slept in her crib and she sleeps on a floor-bed until we put her in our bed at night. 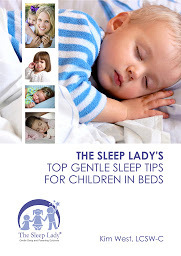 Would you suggest sleep coaching, I like to call it coaching, her in a crib or trying to sleep train her on the floor-bed to avoid another transition to a toddler bed. I think it might be more difficult to avoid nursing her on a floor-bed but it’s more familiar to her. So…where should my toddler sleep? The most important question to me is where do you want her to sleep? Clearly at 17 months she’s not in the position to be able to figure out where she wants to sleep, and she would only want what she’s always had. Before you start, I think you need to decide where she’ll sleep. Maybe speak with the other parent about where do you want your daughter to sleep. Simply put, do you want her in your room or in her own room? I would encourage you not to have her go to a floor bed. She’s really, really young, and you could end up with a lot of crying-especially if she’s in her own room. You’d have to completely safety-proof wherever she’s sleeping, and you’ll probably end up having to gate the door. So it will probably be better if you didn’t pursue that option. If you’re absolutely adamant about a floor bed, then I would tell you to start co-sleeping with her in her room in whatever bed it is that you desire her to sleep. Then you can do The Shuffle from there, then out of the room, knowing that you’re more than likely going to gate the door. I can not guarantee that she will really understand that she needs to stay in her bed and sleep through the night but you certainly can try it. If you choose to try this, be honest with yourself about how it’s working. I’ve found that often, the parent says, ‘you know what my 17-month old doesn’t understand this, and I’m asking her to do something she’s not ready to do developmentally and that’s not fair.’ That’s when many parents go and get the crib (purchasing one if they don’t own one) and start transitioning to putting her into the crib and then doing The Shuffle in her room. So think about that question: Where do you want her to sleep? I gave you suggestions for both options, depending on where you do want her to sleep. Also, please know that The Shuffle is outlined in full detail in my book Goodnight, Sleep Tight. If you have shared a similar experience in trying to decide where your child should sleep before beginning sleep coaching, feel free to share your experiences and support. Please feel free to click the “reply” link under this article and leave them a comment. Supporting each other makes parenting so much easier!